It could just be the people I know (lots of South Asians, lots of business school graduates), but Muhammad Yunus is a big deal. He basically invented micro-lending, a revolutionary idea that focused on lending small amounts of money to poor people. In most economic systems, banks are there to lend large sums of money to people who can afford to spend large sums of money. Yunus turned this system on its head, arguing that many poor people just need a little help to move up the economic ladder, and that the banking system fails them by focusing on the wealthy. He created the Grameen Bank, a bank dedicated to the rural poor, and rural poor women in particular. In a very, very general sense, Grameen Bank is the Wal-Mart of the banking industry - it seeks to make up in volume what other banks make in margin. Yunus also wrote a book about himself and the process of creating the Grameen Bank, Banker to the Poor. I was excited to read a book by someone who so disrupted one of the oldest and most "old boys' club" systems the world over by catering to those who are so often overlooked. And reading about his process, and the work he did, was really quite inspiring. But ... in a way ... almost too inspiring. The book felt a bit too much like propaganda to me, rather than an honest account of what Yunus was up against. Yunus likes to tell stories about how he stood up to the World Bank and made a lot of moral stands against corrupt government officials and greedy bankers. In contrast, he hardly ever shares any stories about his borrowers moving up the economic ladder! He will give us glimpses into people's lives (usually how horrible a woman's life was before she became a borrower and how happy she is now), but I could not see evidence of those borrowers moving out of poverty. Yes, they borrowed money, often repeatedly, to build better roofs or a new cooking stove. But did their children learn to read? Did their daughters finish school? Are their children set up for a better life? Information like that was frustratingly hard to come by. I also thought the most interesting information about the bank's workings were missing. 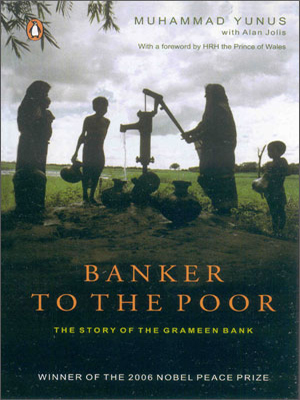 For example, one of the key tenets of Grameen Bank's lending system is that people have to form groups. There are five people in each group and they decide who gets to borrow money, how it will be spent, and police the other members. It's very complex (and quite controversial - the peer pressure can be overwhelming). But Yunus spends hardly any time at all on describing how the bank came up with the idea of group lending and the intricacies of using peer pressure to get your desired outcome. He just says that it took a lot of work to get to the current system, and that the system works very well. Yunus has done so much to disrupt a system that seems stacked against the people who need it most. He is a recipient of the Nobel Peace Prize, has all sorts of honorary degrees, stood up to a corrupt government and influenced the World Bank's lending practices. He's done a lot of good for the world. But his book is, I suspect, written to bring in the donations, and so comes across as a little too theatrical and David-and-Goliath than is realistic. I tend to prefer to read books by people without a stake in proving something -- I'd love to read a history of these same events written by someone who did lots of interviews with all the involved parties, etc etc. I was interested in this book until I read your review. I'm with Jenny, this book would have been better from a different perspective.